The Sunset Pavilion is our newest addition to the Memory Gardens. 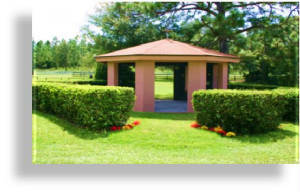 The Pavilion was erected in place of the Memorial Wall that had stood for almost 15 years and bore the photos of those pets that have passed. The Sunset Pavilion will now have that honor and those pictures, transferred on metal plates, will now have added protection from the elements. It is a beautiful addition and we welcome those who would like to add to its walls, a metal photo plate of your departed loved one (we welcome plaques for humans, also). The plates are available in various sizes (prices start at $49.00) and may include an inscription along with the photo. Your original photo will be returned and can be sized or enhanced without harm to the original. 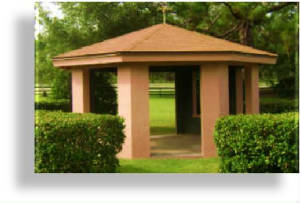 Once they are completed, you may place the plaque in the Pavilion. The Sunset Pavilion offers a private place for reflection. A lasting Memorial that, for years to come will honor those that have passed.